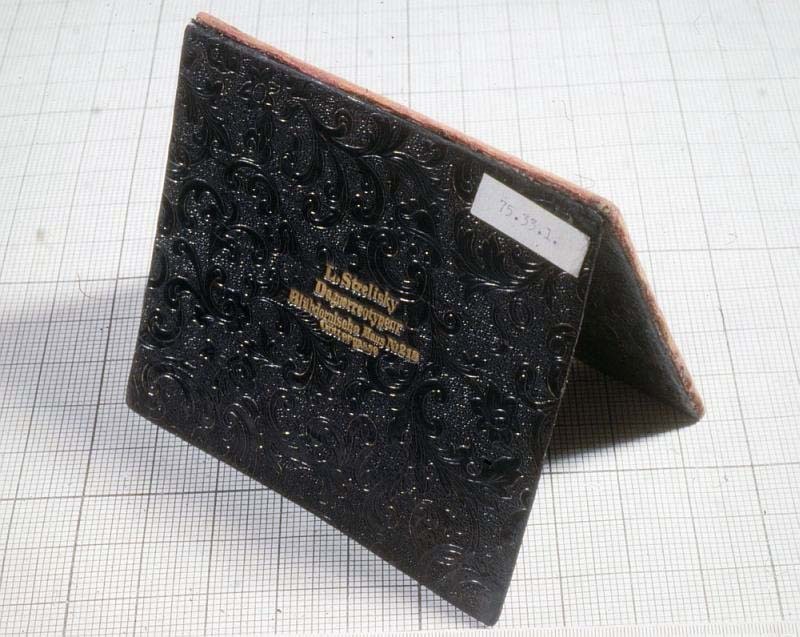 In connection with a 1989 exhibit – under some adventurous circumstances – I have had the opportunity to complete basic preventive actions on a portion of the Hungarian public collection of daguerreotype stock, such as restoring or preparing vacuum packing, etc. I have reported of the experience gained from this work during the Book and Paper Restoration Conference in September 1990. We shall talk more about that. Due to my circumstances I was unable to proceed later with my previous work as Society in general will not reward individual initiatives especially if they are not synchronized with the special sphere of interest prevalent in a particular field of action. I could not resist the urge, however, not to continue process this valuable data base when the technical conditions became available for me again. In order to try this possibility I have examined the probability of a suspicion emerged during another work. 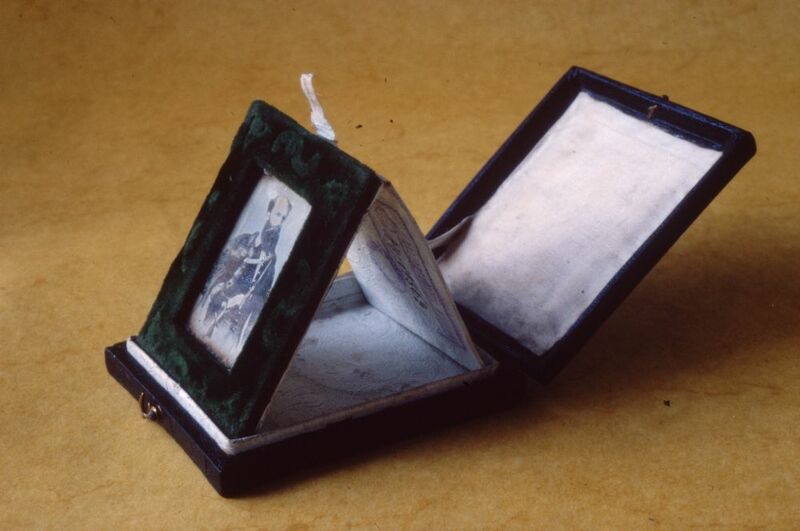 It appeared to me how similar are that the photographic method and total characteristics of two daguerreotypes to the Petoefi daguerreotype the author of which has been a subject of debate from the beginning. I have first published the results of my experiment during the National Restoration Conference of the Hungarian National Museum in 1996. Let me mention in advance that I do not want to reserve myself the right to decide the question. I should only like to publish what I have found out. I believe that this will be the first verifiable data base established based on material facts in this area. My other purpose with this paper is to call attention again to the usefulness of, and the necessity to establish a data base of Daguerre plates. I have mentioned that during the conference in my presentation without any notable result. We shall talk more about that later. The process was broadly used from the beginning of the 1840-s to the beginning of the 1850-s, in the same time during which the Talbotipe(Calotype) process producing (paper) negative/positive picture was also used. These two procedures were supplanted in the 1850-s by the wet collodion negative and albumin paper positive method. 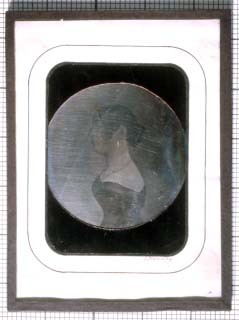 Usually the daguerreotype plates were ½ mm thick copper plates polished and silver plated on one side. The most often found silver plating technology was electrolysis (after 1851), but especially in the beginning it could have been done with several complicated mechanical processes. On the whole they were prepared in workshops in greater quantity and reached the consumers as finished product as opposed to the other materials of the photographic technique used that time which were prepared by the picture taker. The plates were on the market in various qualities primarily determined by the thickness of the silver layer. 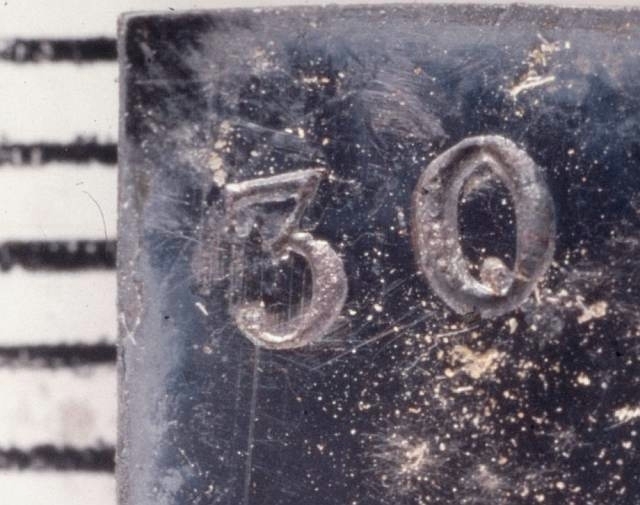 The quality and method of preparation were often designated by conventional symbols on the plates; the most often used quality symbol relating to the silver content was 40 and 30. This means that 1/40th or 1/30th part of the total mass of the plate was silver. I know of a scale from 10 to 60, but during the period the scales were widely used the symbols 20 and 30 were most common. Such symbols suggest a plate originating from a French source as its use was prescribed there, but they can also be found on American plates where they were in use due to market pressures. Hallmarks of JP. and Gaudin. The dimensions of a plate are also characteristic. From the beginning they used “standard” sizes, the standard for a whole plate being the 6x8 Parisian inch size (162x210 mm.). The most often used sizes were designated by their relation to the whole plate, i. e.: quarter plate, sixth plate, eighth plate. 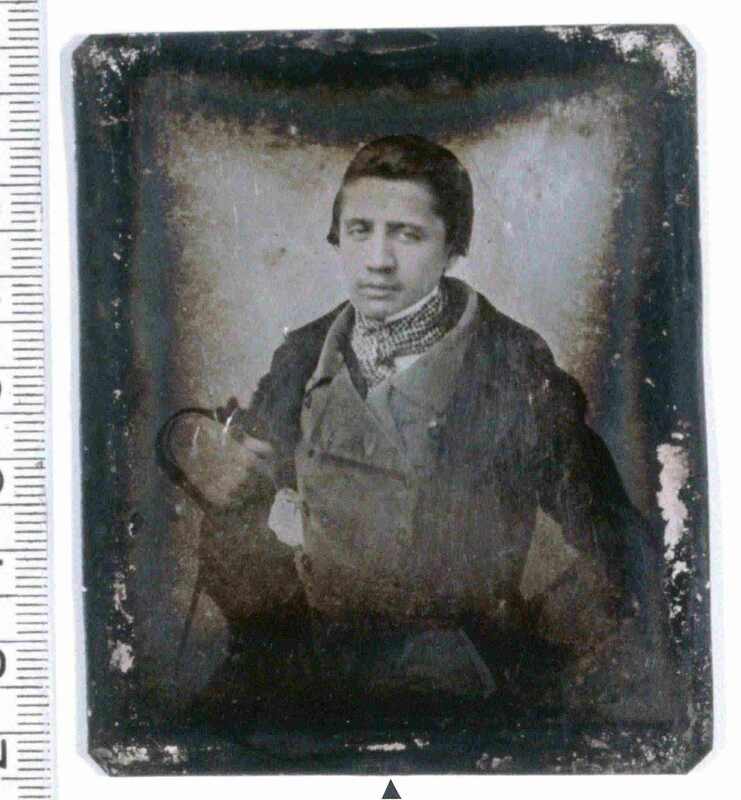 Use this link to see the size chart of the daguerreotype plates. From the point of this research the sixth plate and the eighth plate will be interesting. These were, incidentally, the most often used sizes. The reason for various side dimensions found in a standard size is that the measure has changed during the course of time. Variations are also caused by the fact that the measure was derived from the Parisian inch and the inch meant a different length in different countries at various times. Thus one can find dimensions according to the British inch, the Prussian Zoll (inch), of the Viennese inch too. The ornamental protective used at some pictures (in future: installation), its stylistical elements, construction, material, etc. are also characteristic for a certain period, region, and in some cases for the manufacturer too. (This was the subject of my lecture mentioned in the Introduction. Hopefully the content of it appearing in the home page will soon evolve to the point where instead of this sentence there will be a link here). In the following the primary importance will be placed on the variations in general use in the Austro-Hungarian Monarchy and its neighborhood. The protective packaging used from the beginning protected the plate from the influence of the corrosive materials in the air which discolor the plate and cause the picture to become invisible. Even though this method of conservation was documented in the Hungarian translation by Jakab Zimmermann which appeared in the 1840-s, it managed to get forgotten in the later years. 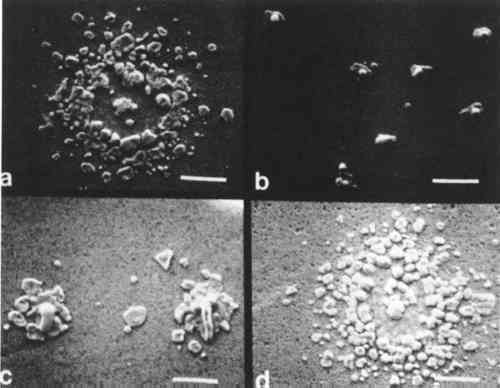 The oxidized pictures would be enthusiastically cleaned with the potassium cyanide method as the one shown below. This procedure, used often by many for the next 100 years, has the most damaging side effects. In Hungary it was in use until the 1960-s. More than likely, we can thank the current bad condition of this picture to these two unfortunate circumstances (Oxidation due to the lack of protective packaging, then potassium cyanide cleaning followed by the same cycle). 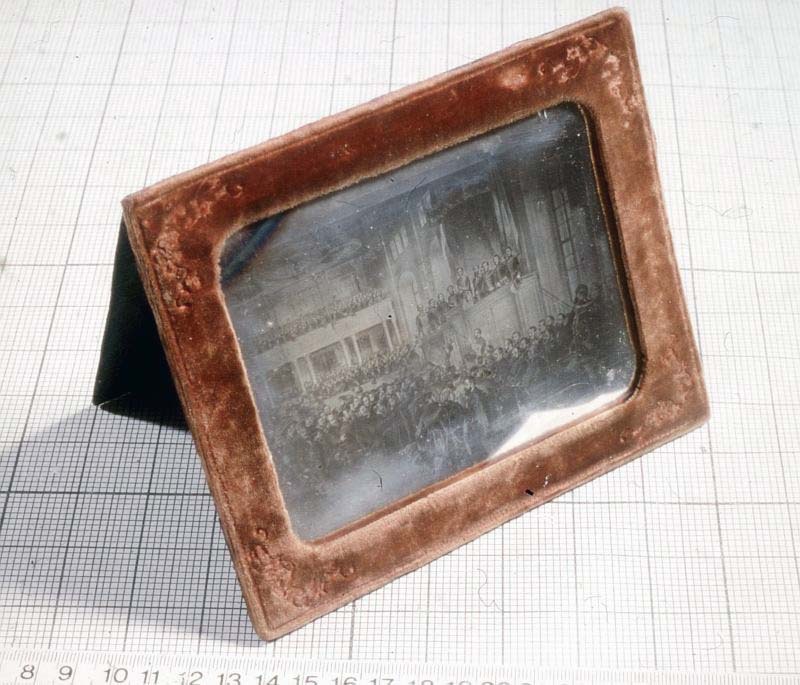 (See the paper by Károly Escher about his cleaning process of this daguerreotype. Hungarian language text.). A well maintained protective packaging and reasonably good storage procedure could have normally preserved the pictures in good condition even to these days. As seen from the previously mentioned Collection Sheet (blank form) many other technical characteristics can also be collected but I will only mention those that are important to the discussion. Naturally, I do not desire to take a stand regarding the historical data during this research. My data base consists of those existing publications that were available to me. 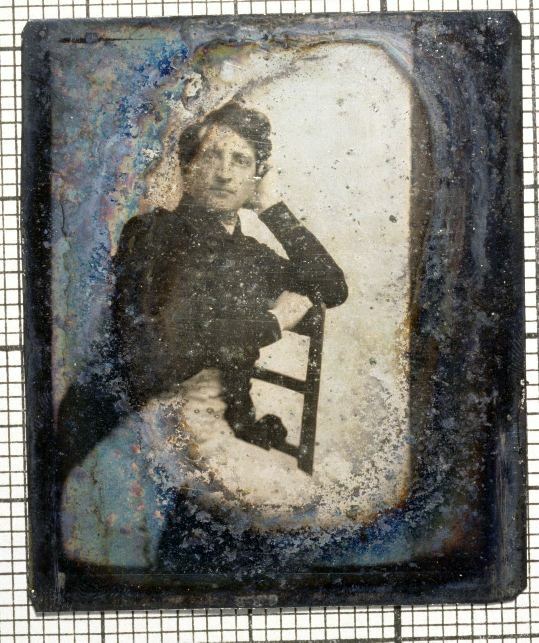 According to the verbal tradition the Petőfi daguerreotype is the creation of the photograph Lipot Strelinsky. This fact was already contested by the 1963 edition of the Fotolexikon (Akademiai Kiado, photohistorical editor Zoltan Király) among other sources. According to various reminiscences the actor Gábor Egressy, functioning as a photo amateur, among others had taken the picture of his actor college, Petőfi, too. Lipót Strelisky was a significant member of the early Hungarian photography. From goldsmith he became a photographer. I have not found hallmarks on those plates known by me that were supposed to be made by him. It can be supposed that as goldsmith, he (also) used plates prepared by himself. 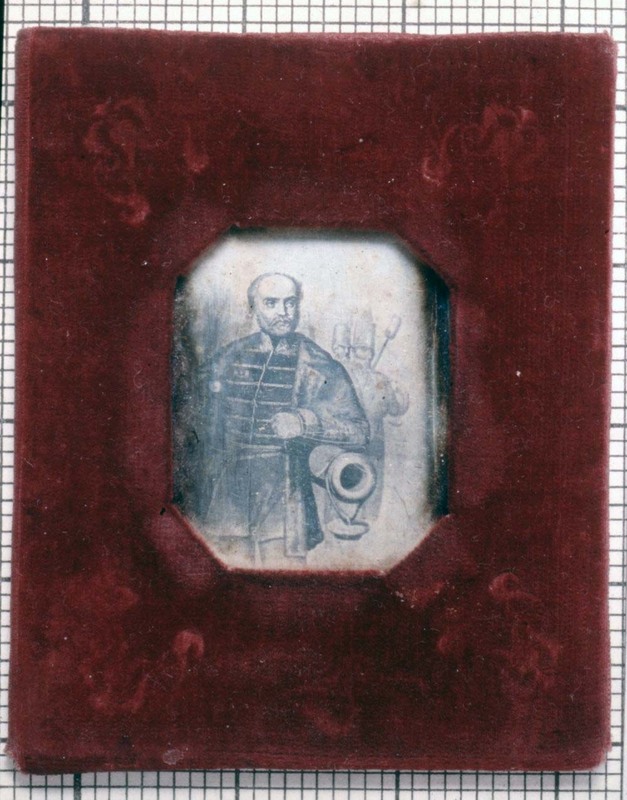 According to various sources he served in the home guards during the Hungarian revolution (1848/49) and photographed its prominent personalities partly with daguerreotype partly with talbotype technique. The location of these pictures, if still exist, is unknown. During the years of absolutism he continued to distribute the pictures of the revolution’s main players reproduced using photo technical processes (daguerreotype?) for which he was imprisoned in the Újépulet (New Building, notorious prison), although in the book by Etelka Baji about Strelinsky the contemporary judicial books do not mention this fact. More than likely these pictures were reproductions of artistic pictures prepared using graphical multiplying processes (such as the one shown here). 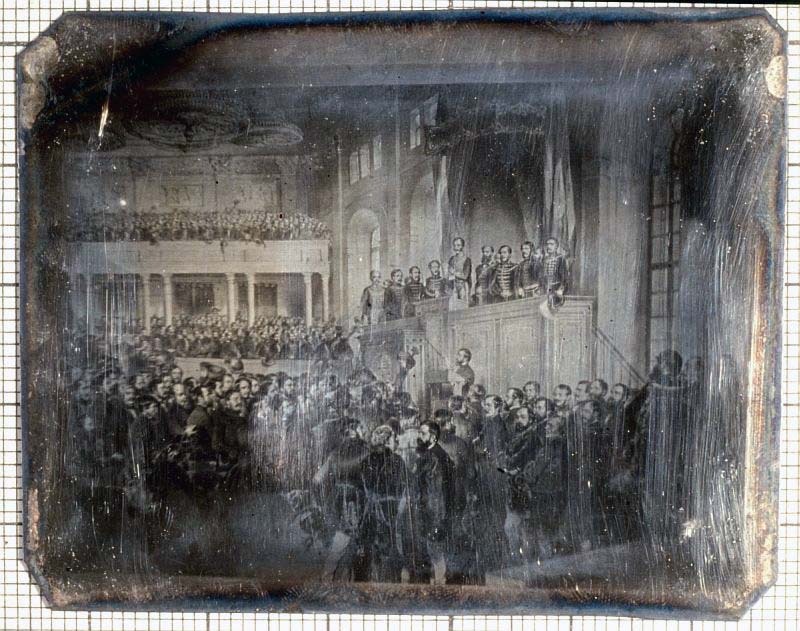 Daguerreotype reproduction of Strelisky of the lithography of József Borsos – August Pettenkoffen: The opening of the first Hungarian parliament (5 July, 1848, Pest). 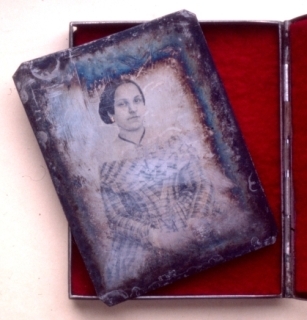 In the domestic collections one can find many, done with the formerly shown technique but with a very small dimension (can be hidden easily) daguerreotype reproductions of pictures created with graphical multiplying processes of renowned actors of the revolution. 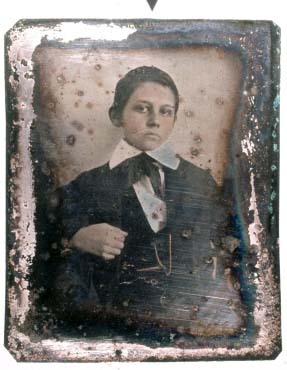 Naturally, as in the majority of the daguerreotype pictures, - and here the reason can easily be understood – without signature. I feel really strongly that these, too, originate from Strelisky and I, or someone else will one day be able to prove that. The currently touched upon subject should also merit some research and rediscovery for the photographic history. Lajos Kossuth, from the Prinzhoffer lithography ( owned by the Hungarian National Museum) can be enlarged by clicking on the picture. József Bem, from the Tyroler copper engraving (owned by the Hungarian Museum of Photography) can be enlarged by clicking on the picture. Lajos Aulich, from the Krauser lithography (owned by the Hungarian National Museum) can be enlarged by clicking on the picture. 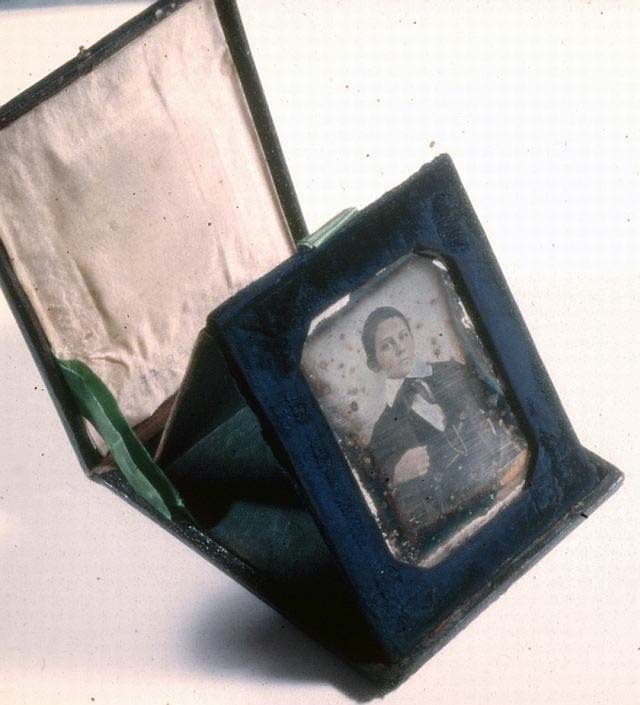 These pictures also exemplify the characteristic and complete daguerreotype installation used in the second half of the 1840-s in our region. 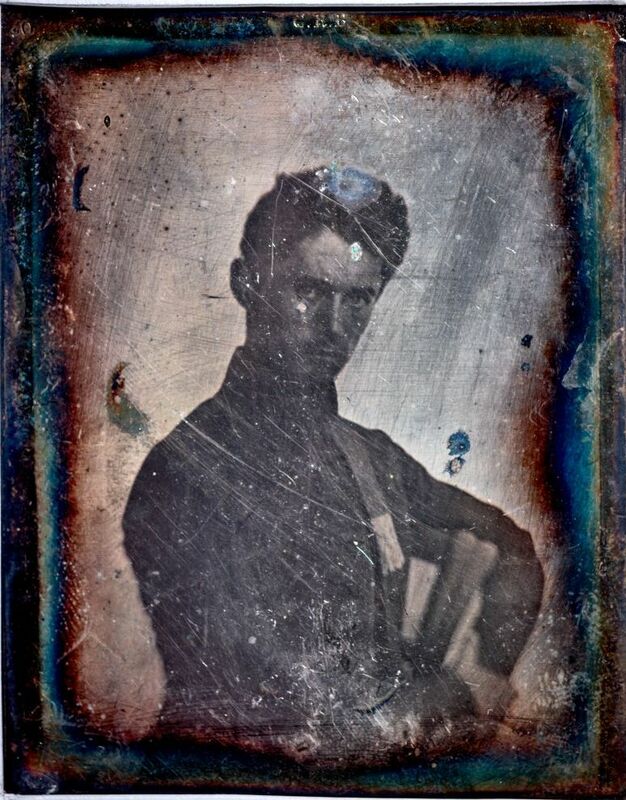 It may be surmised that Strelisky, as the famous photographer whose fate was associated with the revolution, was “given” the title of the photographer of the Petőfi daguerreotype by public belief. Naturally the fact cannot be excluded that he (or anyone else) could have made pictures of Sándor Petőfi, as in the last 10 years of his life any number of either daguerreotype or talbotype could have been made of him. Gábor Egressy (1808-1866) is a prominent personality of the contemporary theater and is one of our first amateur photographers. 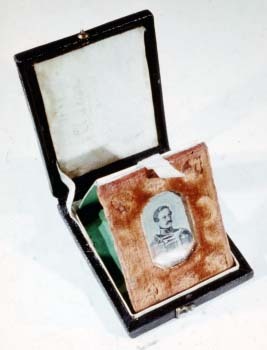 The Hermann Otto Museum of Miskolc owns two daguerreotype self portraits of him. In his memoirs he mentions that he would have liked to record himself in his roles that are why during his trip to Paris in 1843-44 he bought a daguerreotype outfit and learned to photograph from a Parisian Hungarian called Kunwald. His son, Ákos Egressy mentions in his memoirs that his father had photographed his fellow actor Petőfi as well. Well, then, let’s examine the bear. 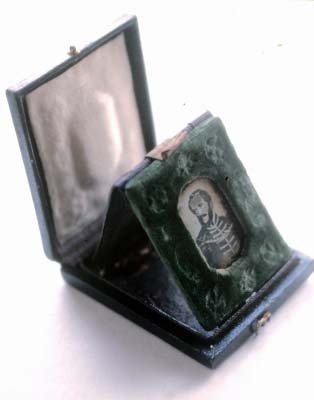 Behold the Petofi daguerreotype with the back of a chair (euphemized as a book by many) under the armpit of the poet (This is important now!!). The picture is a bit blurry. 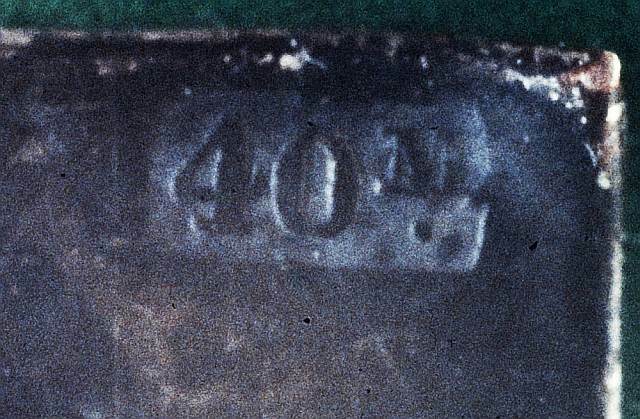 At the top the hallmark G.R.B., at the top left corner the quality designation of 40. The size is a sixth plate but a bit has been cut off the shorter side. It is noticeable that the method of the photography is similar, the pictures are a bit blurry, on each one the back of the chair is at the same side on which the subject is leaning. The reason for this posture could be that while the photographers of the daguerreotype period fixed the subject’s head in a head propping device mounted on the back of the chair in order to ensure that the subject is motionless during the excessive exposure time to produce a sharp picture. An amateur would not possess such implements used in ateliers (The separate, smaller head supports came in general use later). Instead they could use this posture to assist the subject to sit still. If we examine the works of the professional photographers of the period where the subjects aspiration was to sit in a dignified manner, it would be debatable that someone would have adapted such frivol posture in an atelier picture. The comparative illustration below shows the similarity how the pictures’ subjects relate to the back of the chair. Let us look at the sharpness of the picture (but at the middle of the picture, as the lenses at those days were not really suitable for reproduction, as it can be seen at the edges of the picture). As I have mentioned, on the plate of the Petofi picture (as on those of Egressys’) one can see the quality designation of 40 showing a French origin, as well, as a hallmark of G.R.B. (Egressy brought his equipment from Paris.) The size of all three is a sixth plate and on all three a piece had been cut off on the shorter side (too?). With the help of a tabulation chart I have grouped the data of all existing daguerreotype plates according to various hierarchies. 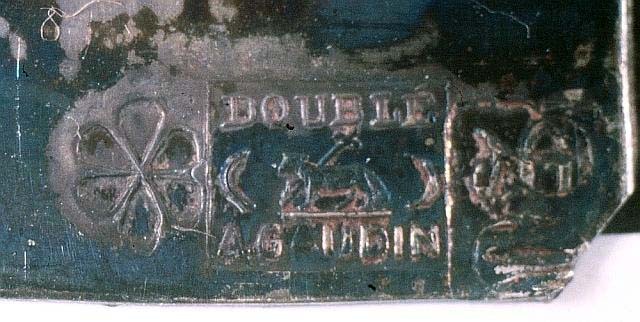 On both of these the hallmark is G.R.B., their size is a sixth plate and a piece had been cut off at their shorter side. The black arrow sign the place of the R.G.B. hallmark. Let us observe what the subject does with his hand shown at the left side of the picture, as compared to the previous three, but this time on the other side! All plates the G.R.B. can be found and with the exemption of one they all have the quality designation of 40 (on the missing one it may have been cut off the designation usually found in the corner). Wherever the original installation survived it is the Monarchy type and all subjects rest their hands on the back of a chair. 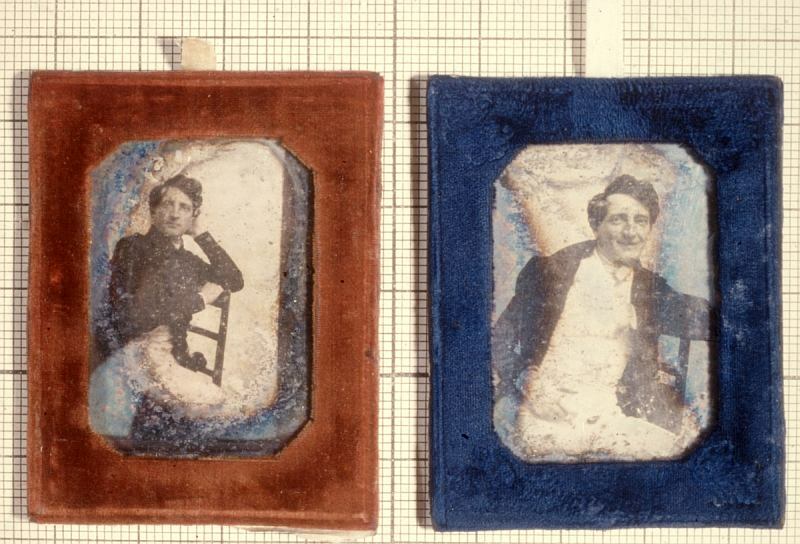 Only these five plates, the Petőfi picture, the two Egressy self portraits and the two portraits of the unknown boys remain. The sixth one is a much smaller portrait of a woman where the subject does not lean on the back of the chair (although this plate was more than likely also cut out of a one-sixth plate, its 58 mm width is greater than the width of the one-eighth plates known by me). Its original installation did not survive. The seventh plate by Kawalky shows the hallmark “G.R.B. Garantie” and is a reproduction of a painting. 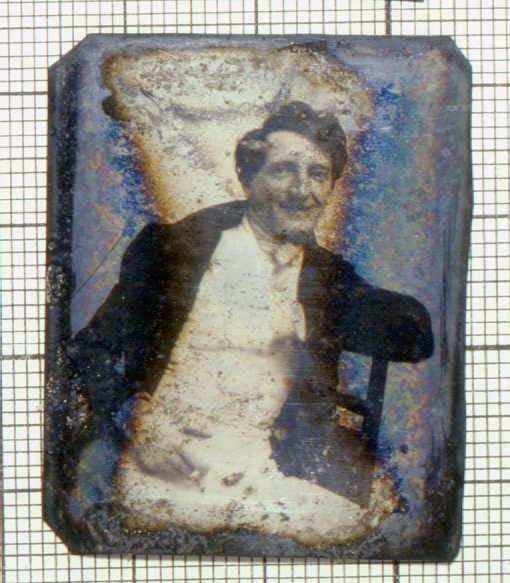 This is a 58x76 mm portrait of a woman (in its pre-conservational condition). On the right side is a reproduction on a 66x83 mm plate signed by Kawalky Lajos (at the bottom right corner of the passé partout). (Made from a drawing from Mrs Röck Istvánné, born Amelie Müller [1820-1843] .) This picture, however, is from an other G.R.B. series, as on the plate there is an other hall mark, a hand written “garantie” annotation.. The question can be asked: Why did Egressy always cut some off the shorter side of the plate? More than likely, because his equipment or some part of it was one eighth size while the plates he purchased were on sixth size. This mistake is conceivable with an amateur ordering in a foreign tongue especially if we observe that the longer side of the two plate sizes is identical and difference exists only in the shorter side. 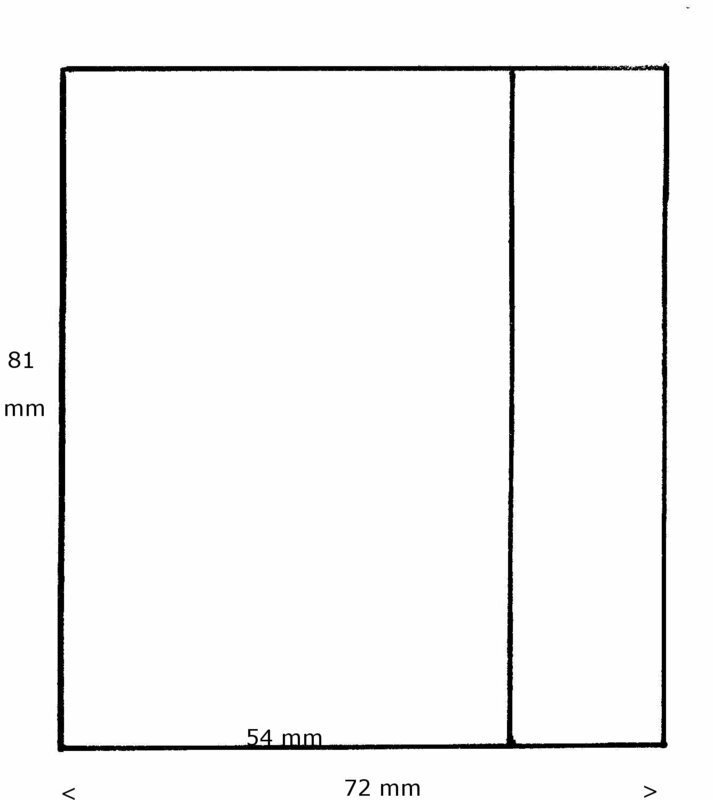 The contours of the one-sixth (81x72 mm) and the one-eighth (81x54 mm) plates. If, for example, his sensitizer or mercury box was smaller, he did not have to cut the plates all the way back to the one eighth size (as he has left all of them a bit larger, too). With a bit of work by a good cabinet maker even the camera could be altered to this size (but it is also possible that the “raw” picture size was this big anyhow). 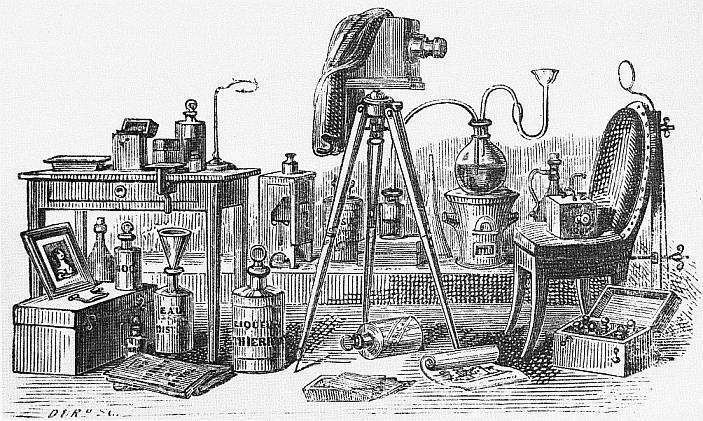 Complete daguerreotype equipment. Thierry 1847. All this could, of course, be accidental, too. Although at this time the question can not be settled with 100% certainty, this data cannot be ignored in the future. Naturally the result would be statistically more valuable if one could work with a data base composed of data from more plates.. It is obvious from the preceding how valuable would be the data collection in some interactive form from those pieces currently all ready on hand. 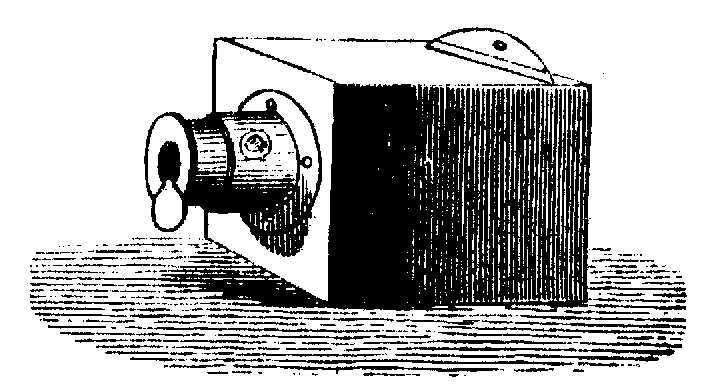 As the instrument of this could be the Internet, for the beginning I started a daguerreotype hallmark collection page on my Homepage in case there are data providers. The historical sources used in this writing are, from among others, from the written and verbal disclosure of: Károly Kincses , Ferenc Kerényi, Imre Fejős, Zoltán Király, NándorVárkonyi, the presented daguerreotypes are from the material of the Petofi Museum of Literature , the Hermann Ottó Museum of Miskolc , the Hungarian National Museum, Hungarian Museum of Photography and the Dobó István Museum of Eger. An especial thanks for Jozsef Ormos for his the pictures of the two woman portraits from Strelisky. On this web page one can only find references obtainable on the Internet.